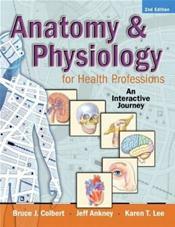 Abstract: Anatomy and Physiology for Health Professionals: An Interactive Journey, 2nd edition along with the accompanying Study Success Companion, integrated DVD, and web-site, are written in a manner that will enhance learning of the material versus mass memorization of facts. New features of this edition include: Updated Test Your Knowledge exercises that appear within the chapter. Expanded end of chapter exercises to enhance critical thinking. Updated Amazing Body Facts and Clinical Application boxes with the latest re-search and clinical information. New animations, games and interactive exercise added to the already popular student DVD. Enhanced student workbook with visual concept maps and more active learning exercises. New book design makes content easier to locate. A great resource for any healthcare professional.